Using stem cells, Japanese scientists have grown artificial skin that contains sweat glands and hair follicles. These highly realistic skin patches could eventually be used to treat burn victims and replace animals in the testing of chemicals. Previous efforts to develop artificial skin have been limited in terms of realism and functionality, including an absence of hair follicles and glands that can secrete oil and sweat. 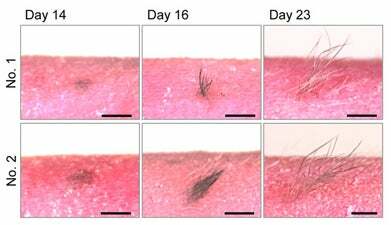 A research team from the RIKEN Center for Developmental Biology, along with several other Japanese institutions, have jointly overcome these limitations, creating lab-grown skin that very closely approximates the function of normal tissue. The details of this work can now be found in Science Advances. Image: Takashi Tsuji, RIKEN To create the artificial skin, the researchers took cells from mice and used chemicals to transform them into induced pluripotent stem cells (undifferentiated cells that can turn into any type of cell in the body). These cells were then transformed into skin cells by recreating the skin's chemical environment. To create the desired functionality, batches of cells were produced to replicate real skin, including the epidermis, dermis and subcutaneous fat layer. Image: Takashi Tsuji, RIKEN After the tissues matured and differentiated, they were transplanted onto the skin of living hairless mice, where they developed normally. 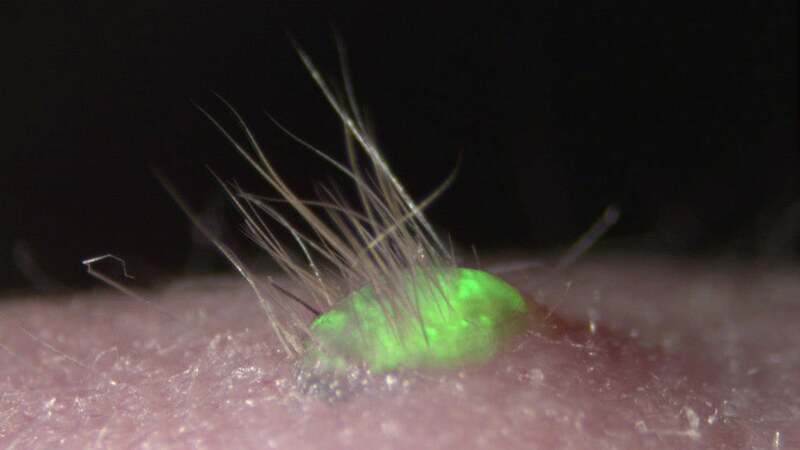 Not only that, the artificial skin made normal connections with the surrounding muscle nerves and fibres, allowing for normal function — including hair growth. The researchers still need to iron out a few problems. For example, the new tissue can connect to nerve fibres, but it can't make them. This could be a problem for patients with severe nerve damage. Also, the hair that grows on the transplanted skin doesn't always align with the skin that appears on the rest of the body. In some cases, white-haired mice had black hair growing out of their new skin. Realistically, it could be about a decade before this technique is used in clinical settings. But as lead researcher Takashi Tsuji noted in a press statement, "We are coming ever closer to the dream of being able to recreate actual organs in the lab for transplantation, and also believe that tissue grown through this method could be used as an alternative to animal testing of chemicals."